A wonderful dish that is not difficult to make but tastes fantastic. Usually do it often because it has both coriander and garlic, two of my favorites. Brush on Chermoula on the chicken and let it get to soak in a few hours. Take some oil in the bottom of tajin. Boil the potatoes in half finished. And place it in the bottom of tajin. Season with salt and sprinkle with a little oil on the potatoes. Add chicken and turn tajinen. Running on low heat for about 60 minutes. Eat and enjoy this wonderful dish. Please take some bread and dip in tajin as they do in Morocco. look delish. just one question, what is chermoula? 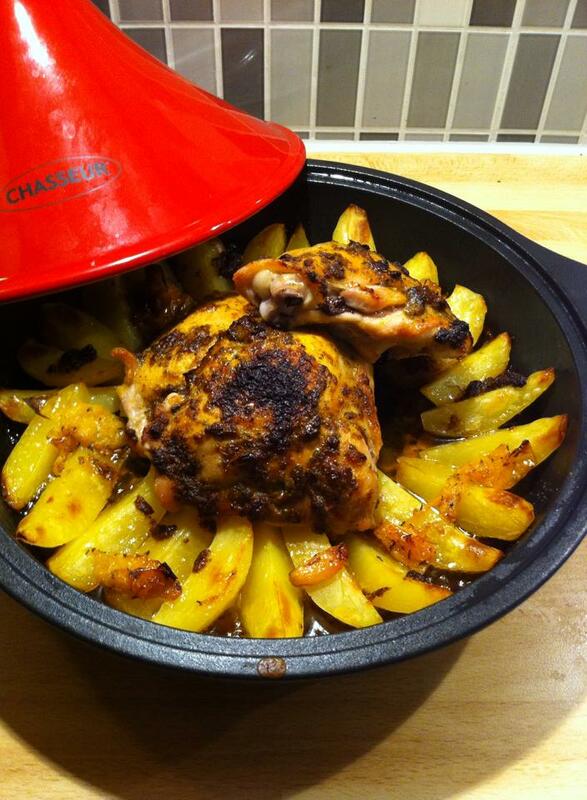 This looks great, I’ll have to try it out in my tajine. I’ve never cooked with chermoula before, is it anything like harissa paste? Well then its a good time to try it out then 🙂 Chermoula is some how like Harissa but with totally different flavours as its different spices and colors. this looks awesome! I’m going to try it. Do you live in Morocco? just curious.